Today (30 June) is Asteroid Day. "Asteroid Day is a global awareness campaign where people from around the world come together to learn about asteroids, the impact hazard they may pose, and what we can do to protect our planet, families, communities, and future generations from future asteroid impacts. Asteroid Day is held each year on the anniversary of the largest impact in recent history, the 1908 Tunguska event in Siberia." Visit the Asteroid Day website for further information. Watch the film 51° NORTH on Vimeo©. ESA Director General Jan Woerner has also posted a video on Youtube. 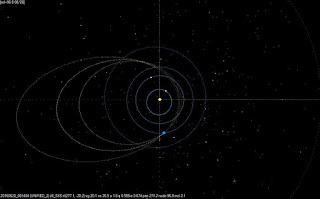 The bolide was detected on Monday 27 June at 10:02UTC, possessed a velocity(x) of -29.1 km/s or 18.2 miles/sec (65,475 mph) and was reported at an altitude of 33km (20 miles). New asteroid discoveries are currently in somewhat of a lull, with only 10 new discoveries in the <0.5AU range within the last 2 weeks (Period "M"). The numbers of new <0.5AU discoveries have been in decline since period "G" (Apr1-Apr15), with a similar trend for <5LD asteroids since period "E" (Mar1-Mar15). 2016 MA was the only <5LD asteroid discovered during period "M" and made its close-approach on June 19 at a distance of 2.6LD. New period "N" begins tomorrow (July 1). So far, in 2016, there have been 29,849 new <0.5AU discoveries and 211 <10LD discoveries. (Source for all stats: eissco.co.uk). Meteorite Arizona Fireball Found by ASU Team! After 132 hours of searching, ASU team — in partnership with White Mountain Apaches — locates meteorites on tribal land On June 2, a chunk. Dozens of people reported seeing a fireball in the early morning hours of June 2. NASA says it was a small asteroid that had broken apart. ASU researchers were able to track down small meteorites after a meteor streaked across the night sky earlier this month. A team of researchers announced the discovery of opal fragments found on a meteorite in Antarctica on June 27. A rock hit the garage of Clinton County's Daniel and Kathryn Seip. It seemed to come from the sky. Was it a meteorite? Just what the heck hit Daniel and Kathryn Seip's garage on West Herbison in Clinton County Saturday? 300g 'meteorite' crashes through roof of Thai house. 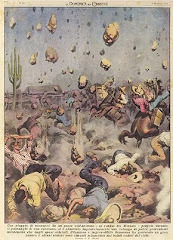 On June 2, a chunk of rock the size of a Volkswagen Beetle hurtled into the atmosphere over the desert Southwest at 40,000 miles per hour and broke . And Whitford witnesses a lot of meteor-wrongs, including another one from DeWitt area Tuesday that turned out to be metal slag. He's looked at more .. The Perseid meteor shower is coming in August. Meteor showers take their names from the point in the sky from which they seem to emerge. by Downes H. Beard A. D. Franchi I. A. Greenwood R. C.
As reported in today's Bangkok Post. Excerpt: "Department head Sarawut Tuantam said the rock’s crust was charcoal black, indicating it had been burned entering Earth's atmosphere at very high speeds. The test also found the chunk contained large amount of iron and was attracted by a magnet." Please visit the original article for full details. A family were left in shock after meteorites started crashing through the roof of their home as they were eating breakfast. The largest rock, the size of a ..
Quasicrystal meteorite Important Finding! VIDEO! ... or center point of an early summer meteor shower, called the Boötids. ... of the sky that might suggest that the meteor shower is his gift to humanity? The Perseid meteor shower will peak August 11 -12 and can be seen throughout most of the Northern Hemisphere. In search of stardust: finding micro-meteorites on your roofWith a strong magnet and a fine sieve you can discover meteorites that have landed on your home. 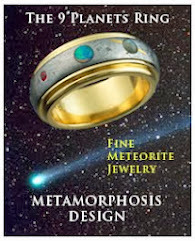 June 30 is World Meteor Watch Day. Meteors are also known as 'shooting stars'. Look up into the night sky and you might see a sudden streak of light. 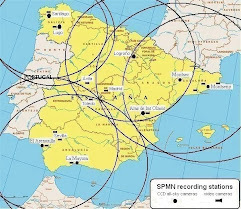 A double cross antenna is great for reception of satellites like NOAA and Meteor since it has a sky oriented radiation pattern with very few nulls. 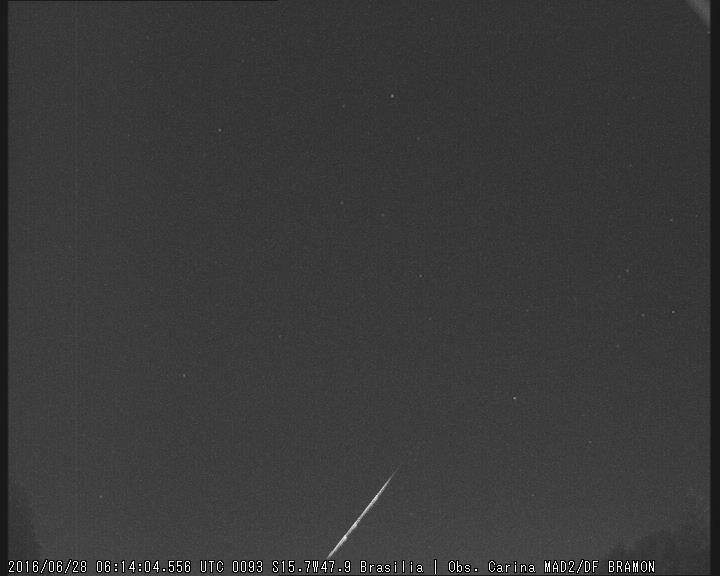 Fireball recorded over Spain just one minute after the start of summer (June 20, at 22:35 UT). Russia to make satellite orbit catalogue public? the spectrum steepening over time for each meteor afterglow. 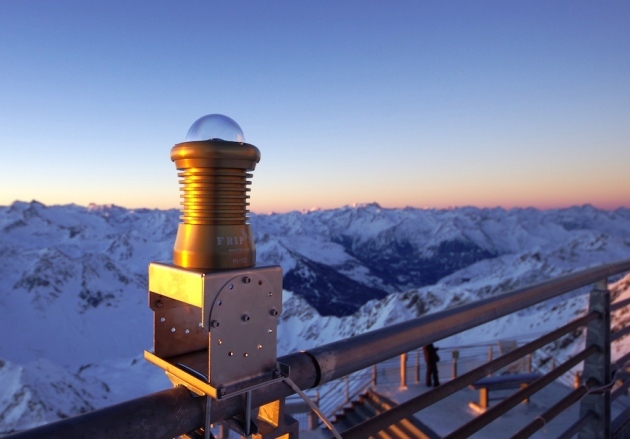 ... Beamformed measurements of two meteorradio afterglows recorded on October 17,. Thanks for EarthCam by recording with his Midtown Skyline HD Streaming camera. A beautiful earthgrazer meteor over São Paulo state, Brazil. A quarry in Sweden is the resting place of a meteorite unlike any ever seen on Earth. What is the history and geology of this bizarre extinct meteorite? It would probably take a series of very large meteor strikes, all over the world, in order to do the kind of mass, worldwide melting you envisage. very unlikely- no! ONT QC NY NJ PA MA Fireball Meteor 14JUN2016 - Breaking! ONT QC NY NJ PA MA MI Fireball Meteor 14JUN2016 - Breaking! MeteorRats take a look! May be rocks on the ground. 14JUN2016 m Kingston,ontario, canada 21:30 5 seconds heading west, low in the sky bright white/orange/blue sun it seemed to burn away to nothing, getting smaller as it moved further along I could hear a whoosh as it went overhead, it seemed really close. I almost thought it was fireworks, but it definitely was not. 14JUN2016 Ben Cahill East Amwell, NJ, USA ~ 21:30pm Eastern Time 5-8 seconds SE-NW, facing NNW, movement mostly down and away from me, slight right-to-left motion. First spotted ~ 30 degrees above horizon, moved to ~20 degrees above. Usual bright yellow/white. No sound. Venus or brighter No None. 14JUN2016 Caroline Ottawa, Ontario, Canada 21:15/EST, PM 5 sec SE to SW facing south Very bright white, yellow Airplane lights Yes I first thought it was an airplane low in the sky that was how bright and big it was. We are very close to the airport here in Ottawa. 14JUN2016 Sandro Belpanno Spencerport, NY USA 2100 EASTERN 4-7 E;NE right to left ? (Colorblind) no sound, but i was standing next to a running pool pump. Moon/venus. Very bright, and the sun ad just set. Sky was still bright. Yes, several. 5-10 It was pretty awesome. 10-20 times brighter than any i have ever seen, but im not an avid skywatcher. 14JUN2016 Lisa Pritchard Rome, NY United States approx 20:25 pm eastern time zone I just saw a small arc as it passed from behind a tree through the tree, and passed some roofs from east to west, right to left, I was facing approx north reds/oranges very bright and vivid, I'd say as bright as moon, but in oranges and reds not that I saw a bit smaller than the moon, but much larger than venus. Like a bright orange red ball of fire with a definite tail. I was in my backyard doing yardwork and around 830pm in Orleans Ontario I saw a fireball in the sky with whoosh sound. First time I've seen this! Very cool! An 8cm space rock called Österplana 65 was found in a limestone quarry in Thorsberg, Sweden that produces floor tiles. It is said to be chemically distinct from any of the 50,000 other such objects held in collections. Dating suggests the meteorite's parent body was involved in a huge collision in the asteroid belt between Mars and Jupiter some 470 million years ago. Please see the full original article on the BBC website. As it turns out, mammals may have been well on their way to displacing the dinos long before the Chicxulub meteor hastened the dinosaur's demise. The Latest Worldwide Meteor/Meteorite News 12JUN2016. ASU granted special permission to search for meteorite on Apache Lands.. .
... ice crystals form on meteor dust (as we are constantly getting bombarded with fine meteor dust) and other particles about 80 to 85 km above Earth. By comparison, researchers with the Spanish Meteor Network - another large and dense network - have scored 2 meteorites in the past 12 years. As of yesterday, the most recent announced discovery was 2016 LJ11 (decimal equivalent = 2016, L, 284). As of 07:55 British Summer Time, this has been superseded by 2016 LY47 (decimal equivalent = 2016, L, 1199). Within those 915 new discoveries, none have a close-approach of <10LD - which is quite unusual. Normally (whatever 'normal' is), 0.7% of the running total <0.5AU discoveries are in the <10LD range, with 0.1% of the running total making a close-approach <1LD. 1) New period "M" starts as of 00:00 Thu-16-June-2016. 2) In comparison, 2015 (periods A-L inclusive) saw a total of 47,551 new <0.5AU discoveries. For the same period of 2016, so far, there have been a total of 29,742 new <0.5AU discoveries - so we're currently 'down' by 37.5% on last year's totals (so far). Comments & queries to "meteordetective AT gmail DOT com". 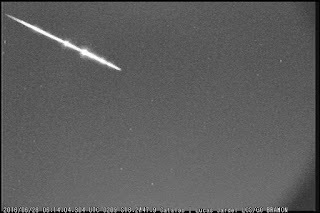 A fireball visual reported over Sao Paulo on fireballs.imo.net, filmed by Exoss Citizen Science, brazilian meteor monitoring. 12Jun2016 Juliana P Sylvania, NSW, Australia 8:40pm 1 second, if that. Noticed it 45 degrees up, and it ended on the horizon line. I was facing WSW. A very bright white. Left a quick trail of dark blue, though it may have been my eyes trying to follow it. Bright as the moon. Reminded me of a lit magnesium strip. One large solid mass. Very quick, hurtling down towards the earth. 10-15 second duration. No damage expected. It appeared to be a meteor or fireball. I've never seen anything like it before. It was flying over Glen Allen, VA 23059 at approximately 9:30 pm EST. Happened yesterday in Washington. Meteor Everett. Taken on Highway 2 trestle headed West at 4:35 am. AMS received 57 reports about a fireball seen over NC, DC, VA, MD, SC and NJ on Saturday, June 11th 2016 around 02:02 UT. A Chinese space lab is bound to come back to Earth soon, but when and where this happens is a matter of debate and speculation. 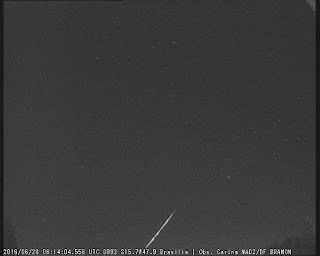 NEOs Close Approach June 2016 - Bolide Fireball Meteor Alert! MeteorRats Worldwide be on Standby! 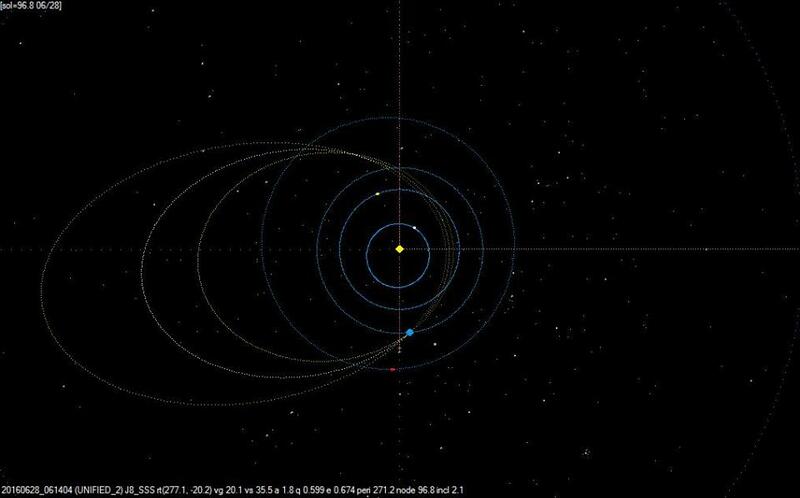 There are currently 5, 9 15 known NEO Asteroids discovered that will pass within approximately 10LD or less (LD stands for "Lunar Distance"), in the month of June 2016. I expect that 10-15 or more 10LD NEOs will be discovered before month end. Expect some spectacular bolides, fireballs, and meteors this month and especially large ones 3-5 days before and following the passing of the less than 10LD NEOs and 6 small mountain-sized NEO asteroids, diameters ranging from 400m- 2.5.km, that will safely pass this month.